i could have this soup year-round really, but it’s especially good for these balmy fall days we’ve been having around here. i realize it’s the beginning of december now, and in most parts of the country the air isn’t so much “balmy” as it is biting, and it’d be silly to call this season fall. but down the lane where i live, the leaves on the trees have finally flared up in their most vivid reds and yellows and the leaves on the ground are crunchy as chips, all clustered in the gutters. and except for the blustery currents of rain coming down yesterday, the wind these days is dry but soft – carrying with it a lingering warmth from our strong-armed california summers, i’d like to think. so the scene is set for a no-fuss meal like this one: your traditional tomato soup, but tricked out with blue cheese and sriracha sauce. ladle some out on a brisk and golden afternoon, and you’ve got yourself a bowl of lunch that will keep your hands warm and leave some heat on your tongue. 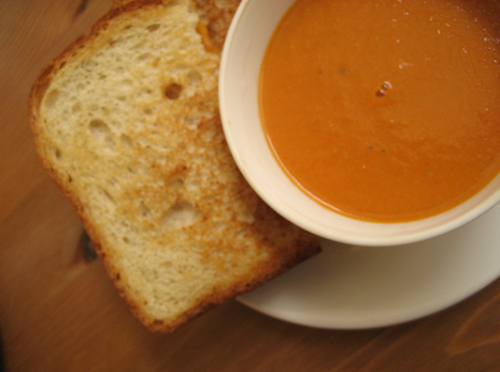 with a piece of crispy, butter-browned bread to sop up the smooth-as-velvet soup, nothing matches this weather better. Heat the olive oil in a 4-quart pot over medium heat. When the oil is hot, add the onion and a pinch of salt and sweat for 2 minutes until the onions are soft and translucent. Add the garlic and continue to sweat for 2 more minutes. Add the tomatoes, their juice and the stock and bring to a simmer. Add the cream and sriracha sauce and simmer for 45 minutes. Pour the soup into a blender, add the blue cheese, and blend until smooth, working in batches if needed. Strain through a fine-mesh strainer into a clean pot. (How smooth the soup’s final texture is will depend on how much of the solids you push through at this point.) Taste, adjust the seasoning if necessary (I added another ½ teaspoon of salt here), and reheat to serve. The soup will keep, covered in the refrigerator, for a few days.